Do we effectively get more space in picasaweb, or do we have to migrate everything over to drive? no, pics/videos stay in picasa, not affecting your storage limits. trust me, it's a good thing. The writer doesn't want to take the time to click maybe one or two more times than he has to. I don't know how anybody can complain about all this free stuff. It is good. It just means there are two completely different ways of backing up and sharing pictures. I'll have to choose carefully between them. You're thinking about it the wrong way. Can't you appreciate the 80 GB and consider the different service like different drives or folders on a windows computer? I'm running a chromebook, have all of my apps/services right on my desktop, and I know where to find what I'm looking for. I'm also sure that once it all gets up & running smooth, you can probably find what you want in the google search bar. Don't forget the already limitless* storage available over at Youtube. *Probably only sustainable because so much of the world has got only so many kilobits in upload. I'm really not understanding this. I thought Google was just starting to bring everything together and now they are splitting gmail from other services and still keeping images and music separate. I was expecting more. Was hoping for a slightly more polished GDrive app. The only points where it beats Dropbox is security and pricing. When will Google Music be available in Canada? I'm at the moment (and manually) about to delete all my folders in Picasa Web Albums and in the future I will only store it online via Drive. 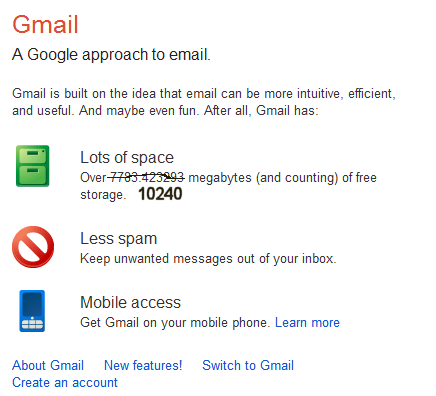 it is very time consumin isn't it, please hear us google..
Nobody is complaining about if 10Gb only for emails is enough or not: that's something!. The reason behind it is technical. With Music, they would have a lot of users storing exactly the same bits, which means that through something called deduplication allowing the equivalent of 80Gb of storage for free is OK because it the storage is not unique per user. I thank Google once again for this, I have been using Gmail for as long as I can remember, never had one complaint about it. We absolutely love it and also use it for our online toner cartridge business.